If you're tired of your traditional urban landscape, these cities across the globe will offer plenty of colour to brighten your view. From Thailand to Peru, these are some of the most colorful cities around the world. You'll want to grab your passport and jet off to these destinations immediately, and who could blame you? These cities are stunning. Havana, Cuba - take a trip back in time as you stroll Havana's colourful neighbourhoods. You'll find bright-coloured buildings and vintage cars lining the streets. Look to the rooftops and note their distinct Moorish style. Rio de Janeiro, Brazil - you can't miss the colourful buildings within the city, but you should definitely scout out the Santa Marta favela, where residents have transformed their neighbourhood into a massive art canvas. Charleston, South Carolina - take in all of Charleston's charm as you stroll down Rainbow Row. You'll see 13 stunning colonial-era homes in soft pastels, each one different from the next. Vernazza, Italy - while hiking the Cinque Terre in Italy, be sure to look over the trail to get a bird's eye view of Vernazza. This colourful port city is absolutely breathtaking. Bristol, England - stand on Bristol's harbour side to see the colourful homes in Cliftonwood. Housing in this suburb is often accompanied by Victorian-style terraces. Wroclaw, Poland - visit Rynek Plaza to take in Wroclaw's most colourful square. You'll find plenty of restaurants and outdoor seating to unwind at nearby. 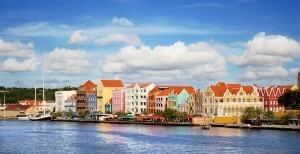 Willemstad, Curaçao - brightly-coloured buildings fill the streets of this island in the southern Caribbean. In Willemstad's city centre, take note of the colonial architecture that was influenced by Dutch styles. Bo-Kaap, Cape Town, South Africa - Bo-Kaap is a traditionally multicultural area in Cape Town. The neighbourhood is known for its brightly coloured homes and cobblestone streets. Balat in Istanbul, Turkey - Balat previously served as Istanbul's old Jewish quarter. It now attracts a more diverse group of residents in addition to visitors who come to see the area's unique architecture and fading colours. Barranco in Lima, Peru - the Barranco neighbourhood is a nice change of pace from Lima's urban scene. You'll find stucco-faced homes in bright colours, as well as graffiti artwork nearby. St John's, Newfoundland, Canada - in St John's, the Victorian buildings have white-trimmed doors and windows and are painted in various bold colours, making them easy to spot from the surrounding water. Old San Juan, Puerto Rico - you'll love the restaurant and bar scene in this colourful, seven-block neighbourhood. While each building has a unique shade, take note of the classic European architecture. La Boca, Buenos Aires, Argentina - the neighbourhood located at the mouth of the Riachuelo River had an interesting start. It was constructed with mismatched scrap metal from nearby shipyards, and residents gathered all the paint they could find to give the metal a new look, hence the puzzle-like designs you can see there today. Pattaya, Thailand - Pattaya may be known for its nightlife scene, but the city's bright colours attract visitors seeking beauty as well. Take in the view from one of the many high-rise condos or resorts. San Francisco, California - San Francisco's "Painted Ladies" homes on 710-720 Steiner Street, across from Alamo Square, are iconic. They are referred to as "Postcard Row" for a reason, and are definitely worth seeing in person.